In fact, if you hit '?' you'll see a whole list of useful things I didn't know about, some of which (like toggling fullscreen mode, or removing the left-hand panel) have no apparent access via the mouse. If I were the sort of zealot who engaged in UI wars, I'd label this whole thing "unintuitive," and claim that hiding useful features this way proves that Google's UI updates are making their products less user-friendly. But frankly, if these features are available and I can find out about them eventually, I don't care if it's intuitive or not. 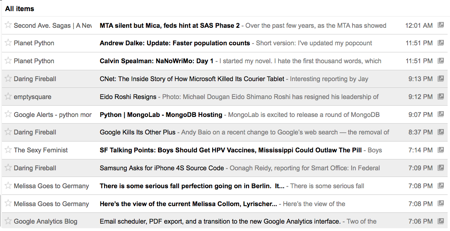 Followup the second: The awful Reader update has driven me to read my RSS feeds in NetNewsWire, and I'm glad it has. NNW is a lovely, fast, capable app, better even than the old Reader.